MIAMI By bus and car, commercial flight and charter, U.S.-based Venezuelans are traveling en masse to New Orleans in the coming days, spending hundreds of dollars and in some cases more than a day of their time to cast a vote in their country's presidential election. The government of President Hugo Chavez earlier this year closed the country's consulate in Miami, where most Venezuelans living in the U.S. have cast ballots in the past. It later said voters would have to travel to New Orleans if they want to participate on Oct. 7. It's a hardship in terms of time and money for many potential voters. But some, especially those who want to stop Chavez from being re-elected after 13 years in power, are determined to make the trip anyway. Carolina Guevara, a 21-year-old college student, plans to take the 15-hour bus ride from Miami to New Orleans, an 870-mile trek. "We want to demonstrate to the government that even if they put obstacles in our path, we will practice our right to vote," said Guevara, who hopes to return to Venezuela after completing her political science studies at Miami Dade College. "They tried to do everything possible to prevent us from voting," said Gisela Parra, a former judge who left Venezuela in 2005 after being accused of conspiring against Chavez. "The pressure was such that they had to open a voting center far away, in New Orleans. It's like punishing us." Parra, who plans to volunteer at the New Orleans voting center, said Venezuelan electoral officials "had the obligation" to make another Miami location available. But Tibisay Lucena, president of Venezuela's Elections Council, countered that voters registered in Miami "were relocated using the same criteria used inside the country, telling them to go to the nearest polling station." About 15,800 Venezuelans in the U.S. voted in their country's Dec. 2006 presidential election, three-quarters of them in Miami. Of the 10,800 Venezuelans voting in Florida, 98 percent cast ballots for the opposition candidate and 2 percent for Chavez. Thirty-four percent of registered voters did not participate, according to figures from Venezuela's Elections Council. Most Venezuelans in the U.S. are professionals or businesspeople who left their country after Chavez became president in 1999. The number of Venezuelans in the U.S. burgeoned from 91,500 in 2000 to 215,000 in 2010, according to the 2010 Census, with 57 percent of them living in Florida. Numerous groups surfaced to assist U.S.-based Venezuelan voters, with information distributed on the Internet and social media, as well as at coffee shops and bookstores frequented by Venezuelans. 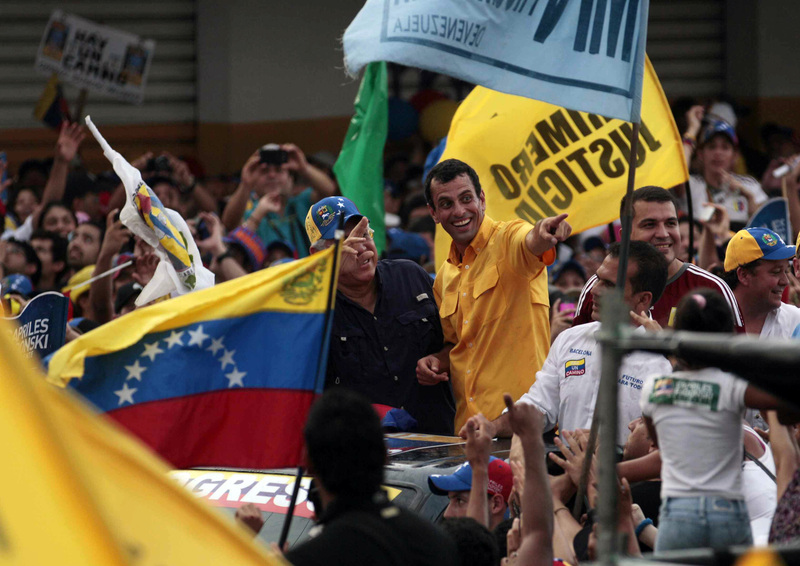 The groups include Voto Joven and Voto Donde Sea, comprised mostly of young people, and the Mesa de la Unidad Democratica, or Democratic Unity Table, a coalition of political parties backing opposition presidential candidate Henrique Capriles. Beatriz Olavarria, who leads a commission created by the opposition alliance to distribute voter information and mobilize observers, said she hopes at least half of the voters registered in Miami will cast ballots in New Orleans. "Something tells me that many people will get on board at the last minute," she said. Olavarria, who has volunteered in Miami during past Venezuelan elections, created the website www.Miami7octubre.com, to provide information about the New Orleans vote. The group's major push now is figuring out how to get registered voters to the Louisiana city, where balloting will be held in a convention center. Opposition members complain that voting will not occur inside the mission itself, but Lucena, the electoral council president, said "the rules state that the polling center must be as near as possible to a consulate." In most cases, traveling from here to New Orleans to vote would require at least one night away from home. With travel costs a major obstacle for many potential voters, financial adviser Andres Casanova and his childhood friend Andres Morrison are collecting donations to pay for charter planes to ferry Venezuelans to New Orleans. So far, they have received almost $355,700 in donations, enough to pay for trips for 1,100 voters. But far more people - as many as 3,000 - have registered on the organization's website, www.aerovotar.com , for seats assigned on a first-come, first-served basis. Voto Donde Sea, meanwhile, is collecting donations to subsidize bus fares for voters, said group leader Vanessa Duran. Milagros and Fernando Nunez Noda are renting a car with another couple to make the trip from Miami. "We're going no matter what," said Nunez Noda, a journalist and businessman. "It's like they threw down a challenge," he said of the government's decision to move the balloting to New Orleans. "We will prove our strength."